With a new governor and a new year underway, it’s time to get energized about creating meaningful impact in the lives of all Georgians. That is what Literacy For All (LFA), a donor-advised fund of the Community Foundation for Greater Atlanta, set out to do at the end of 2016. Just over two years later, it has influenced a statewide literacy council to focus on multigenerational literacy improvements. Our state is increasingly focused on rapidly-changing workforce needs and the economic mobility of its citizens as we compete to stay the number one state for business in the nation. However, Georgia has a significant hurdle to overcome: one in six Georgians has low literacy skills and 63% of Georgia’s third graders are not reading on grade level. Literacy is a fundamental component of a thriving community and an underlying factor in so many other social issues like poverty, poor health and incarceration. These associated social services cost Georgia’s taxpayers an estimated $1.3 billion annually. Parents and caregivers are a child’s first teacher, yet many parents and adults need additional support to help children achieve critical literacy development milestones. That’s why it’s important to leverage effective community partnerships in a multigenerational approach to break the cycle of low literacy and ensure the well-being of all Georgians. Literacy For All is the evolution of an alliance of literacy nonprofits in the metro Atlanta area that coalesced into a movement primarily funded by one Community Foundation donor. To date, LFA has awarded over $500,000 in grants to support multigenerational literacy programs across metro and rural Georgia. These innovative grants have expanded successful, evidence-based strategies and sparked new and creative community partnerships that seek to address the literacy needs of both adults and children. After a 2017 Deloitte study revealed Georgia’s literacy crisis, LFA partnered with the Georgia Chamber and Georgia Partnership for Excellence in Education to create a business-led literacy commission to identify actionable recommendations at the community level as well as policy and funding recommendations for the legislature. Since the commission’s recommendations were published, LFA teamed up with experts and agencies from around the state to develop an online resource that outlines examples of successful strategies in housing communities, afterschool and youth development and adult education. Throughout 2018 and into the new year, LFA has worked with Georgia Family Connection Partnership, Georgia Department of Early Care and Learning Economic Empowerment Zone coordinators, legislators and other community foundations in Georgia to host community literacy meetings that focus on awareness building and individualized action plans for each unique community. These gatherings have led to the formation of community literacy networks and even a targeted grant program in Augusta. The commission’s recommendations and community-level work have also been supported by Synovus Bank and Georgia Power. 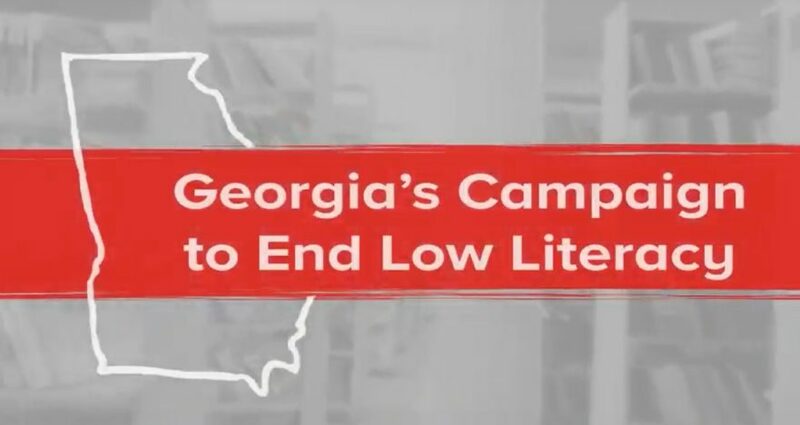 As 2018 came to a close, LFA socialized the Commission’s recommendations with both gubernatorial candidates and developed this video to raise awareness about the literacy crisis and how, together, we can end low literacy in Georgia. For more information about specific ways you can help, visit https://www.literacyforallfund.org/how-you-can-help.